As a music critic, I am continually questioning what purpose I serve. It is, as they say, easy enough to criticise, but there are obligations and expectations in any piece of criticism, and meeting those is a much more difficult task. 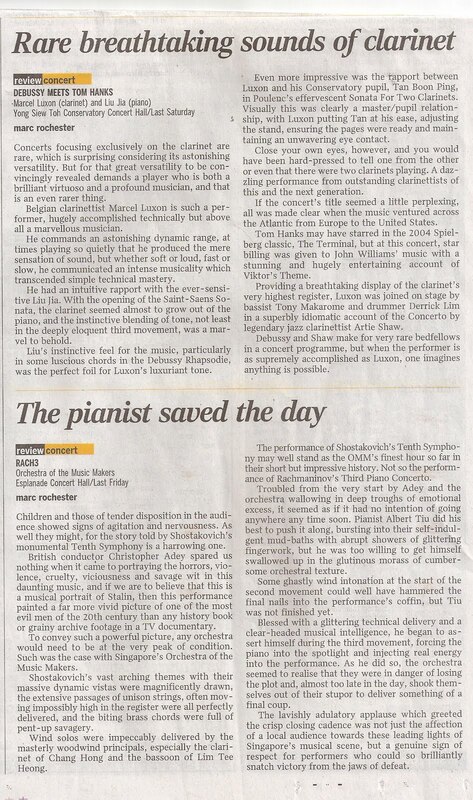 I was prompted to ponder the expectations of both the artists I review and the audience which reads my criticism when, over the weekend, I was asked to review for the Straits Times performances by musicians who, I suspected, might have rather different expectations of me than most. On Friday I was sent to review a concert given by the Orchestra of the Music Makers. They are something of a phenomenon in the musical life of Singapore in that they are essentially an amateur orchestra made up of young people, most of whom have already started out on career paths away from music, but who share not just a love of orchestral playing but a determination to, to put it bluntly, beat the professionals at their own game. They tackle monumental works head on (I last wrote about them after their performance and recording of Mahler 2) and have made no secret of their ambition to make an international splash; not least a burning desire to perform at the BBC Proms. Their dedicated, enthusiastic and highly capable Music Director, Chan Tze Law, is a friend and (temporarily) a colleague, and speaks to me at such length about the orchestra and its aspirations that I sometimes feel as if I am a part of it myself. So what am I expected to do when I review them? I could preface my thoughts with an observation that they are young and amateur, and adjust both my critical yardsticks and the horizons of the readership accordingly; rather like we all used to do at Gramophone magazine when the Naxos label first hit the streets – "A very fine recording, considering its superbudget price" was our mantra, implying that, of course, you wouldn't expect really top class for the money you were asked to pay (there's still a bit of that about, but mercifully most of us assess Naxos on quality irrespective of price). But to do that would be not only patronising to an orchestra with a determination to be treated as professionals, but would undermine their very ethos. Simply put, if the public are expected to pay the same for OMM tickets as for a professional orchestra, they must be judged by the same criteria. However, I also know that what I write will have a very direct bearing on how others will view the work of an orchestra for which I have considerable personal affection and admiration, and to assess their performance without taking into consideration their young and amateur status might create an entirely unfair perception. In the end I decided to treat them as if they were a fully professional bunch and not pull my punches if it turned out to be a failure; after all, as a friend said during the interval, if they must tackle such challenging repertoire, they only have themselves to blame if things go wrong and, perhaps, a bad review might encourage them to adopt a more realistic approach to their public performances. The benefit of adopting this approach is that, when they do something good, the positive aspects of the review will have all the more impact and be taken all the more seriously. Nobody takes seriously a critic who finds everything perfect in an amateur orchestra; even the most basic musical intellect will wonder who the critic is trying to kid. Then on Saturday Marcel Luxon gave a clarinet recital. Marcel is a very dear friend whom I've known since the day in 1998 he arrived in Kuala Lumpur to take up his seat as a founder member of the Malaysian Philharmonic Orchestra. We've been to each other's homes, sat in bars getting drunk together, enjoyed riotous parties, indulged in bitter arguments, discussed world and personal affairs, agonised over marriage partners and friends, and spoken at inordinate length over the finer points of all aspects of music making. In an ideal world, of course, one wouldn't review such a close friend's performance in a public arena; but it's not an ideal world and it's almost inevitable that as one grows older and gets more firmly embedded into the wider musical life, one increasingly finds oneself in this position. When I first got to know the conductor Stephen Layton socially, a man whose outstanding discs on Hyperion I had raved over at length for many years, he expressed a certain regret that we had got on so well. "It seems to me", he lamented, "That whenever I get to know a critic, the very next time he writes about me, he slates my work". Luckily, the very next time (and several times since) a Stephen Layton disc has come for review, I've raved about it as much as ever. But I know what he means; there is a subconscious sense that you are so keen not to let friendship cloud critical judgment that you are often tempted to go too far the other way. The choice facing me was whether to decline the review or go ahead and risk either alienating Marcel or being accused of opening myself up to a charge of favouritism. 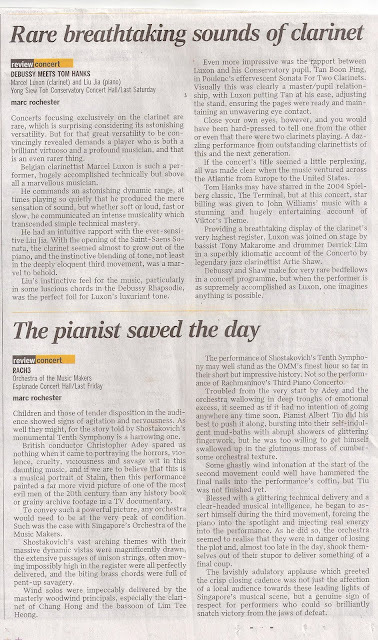 In the end, the deciding factor was the realisation that if I didn't review his concert, nobody would, and he is too important a player not to warrant a review when he gives a public performance. On top of that Marcel is a man for whom music comes first, second, third and last in life, and he would fail to comprehend any comment which was not purely governed by musical considerations. One thing I could be sure of, if anyone felt my review was affected by personal issues, it wouldn't be Marcel. Read the two reviews (which appeared in yesterday's Straits Times) with the full knowledge of the circumstances under which they were written, and decide for yourself how fair or prejudiced they are. There has been a third event which has got me thinking about how musicians and the public regard critics, and that was a lecture I attended last night at the Yong Siew Toh Conservatory on "Barbirolli on Record" given by Dr Raymond Holden from the Royal Academy of Music. It was a marvellous lecture, delivered with real passion and enthusiasm for the subject and highly informative. A shame, I felt, that it was so poorly attended, but in Singapore most people seem to have lost interest in recorded music and fail to recognise its vital importance in the development of music since the early years of the 20th century. But I was brought up short by Holden's almost vitriolic contempt for critics. A comment that a recent piece in Gramophone about conductors was "shallow" almost had me shouting out, "but it's a review magazine, not a work of scholarly depth". I held my tongue then, but worse was to come. Whether Holden has an axe to grind or I have failed to understand what people's expectations of critics is, I can't tell, but something has clearly broken down here. He quoted a Barbirolli letter (dated 23rd April 1930) criticizing in no uncertain terms Mahler's Second Symphony; "The material is very thin, and as regards the orchestral sound Berlioz and Wagner have all done it far more convincingly. It seemed to be an impertinence to want all those people to make that particular music, as if size had become a morbid obsession with him". I liked that, not least because it accords to a certain extent with some of my Mahler reservations. But Holden clearly likes his Mahler, and he likes his Barbirolli, so that was dismissed almost as if it was a joke, not to be taken seriously. However, when it came to averse critical opinion of Barbirolli himself, Holden, was almost speechless with indignation, reading out an offending review in a mocking voice and adding comments to point to contradictions and misconceptions which, so far as I could see, simply weren't there. The review he found so appalling was written by David Cairns in the July 1968 issue and was of Barbirolli's Mahler 6 recording. I have to say I agree wholly with DC's comments (I have the old ASD recording and spent this morning revisiting it), but I can accept that others may not Yet there was nothing in this review (you can access it via www.gramophone.net) which showed anything other than a considered personal assessment. DC described the first movement as being taken "much too slowly" and added "If one cannot take to a tempo, one cannot enjoy a performance". In response to that, Holden seemed to berate the fact that the critic was setting out his own personal opinion on a performance, yet I have always assumed the public expects us to do just that. And he actually became quite bitter when he read; "at his slow tempo the march loses its grim Mahlerian forward stride, to take on a grandiose Elgarian expansiveness". "He only writes that", sneered Holden, "because he knows Barbirolli conducted Elgar". Surely, as critics, we are expected to have a background knowledge of the subject which can inform our writing, but when a speaker as knowledgeable and authoritative as Raymond Holden seems to disagree, I am forced once more to ponder over what artists and the public expect from critics, whether they are friends or complete strangers. Very intriguing Dr. Rochester. Having written a few reviews back in India and aspiring to keep doing so, I have been faced with similar dilemmas and this post gives a critic hope and surety, that this is what we are to do, and what must be done. Yours is indeed a dilemma, but one not unknown to people in many other walks of life, although it'll naturally come to light in differing guises. 'How to Give Feedback' was a favoured phrase when I first attended management courses many years ago, and there are, of course, many other instances too where integrity can easily become compromised I suppose in the end, you can do no more than be true to your calling and write as honestly and objectively as possible (never easy when dealing with an emotive and subjective subject such as music)and if the object of your criticism takes exception - or worse - then so be it. Publish and be damned!! I read both your reviews with great interest and to me they came across as honest and objective. Whether I'd agree with your observations is, of course, another matter entirely, and not having attended the concerts, is a question that must remain forever unanswered! Out of interest, have you come to a conclusion to the question you posed in your opening sentence? It is, after all, a fundamental one! Yes! What purpose does a critic serve? The critic is the voice of the audience, giving feedback (to use that horrible buzzword) to the artist on how successfully the performance communicated what it set out to communicate and giving an opinion for the listener to react to. The voice is, while a personal one and open to argument, informed by experience and knowledge, which gives it authority. An addtional function is as a barometer to the health of the msuical climate. Very succinctly put! I think you've created the music critic's 'Mission Statement' (to use another horribe buzzword)!! Going off on a bit of a tangent here, but I'm sure I either heard or read somewhere that the late and truly great George Thalben-Ball was the soloist in the first British performance of Rachmaninov's Third Piano Concerto. Are you able to confirm or deny? I've spent a whole afternoon in the university library on this one, but I think I have the picture! No. GTB did NOT give the UK premiere of Rach 3. He did perform it at the RCM (under Stanford) in 1915 when he was 18 or 19 and still a piano student, but I can't find an authoritative source to confirm the date yet. Rachmaninov himself gave the UK premiere. Officiaslly he did it in the Queens Hall, London, on 7th November 1911 under Mengelberg. But it seems he actually played it a couple of weeks earlier in Liverpool when he performed it with the Liverpool Philharmonic on 24th October 1911. Thanks very much indeed for the information. I certainly didn't expect you to spend so much time and effort on researching the answer, and cannot now help but feel guilty for you having done so. It goes without saying, I hope, that I am most grateful. Perhaps dinner and a couple of pints on me when next you're in Blighty might help even the score somewhat?